The founder of the performance group Freestyle Love Supreme - Lin has also acted on TV and in film appearing on Sesame Street, The Electric Company, and House, and in The Odd Life of Timothy Green. He stars in the upcoming film, 200 Cartas. 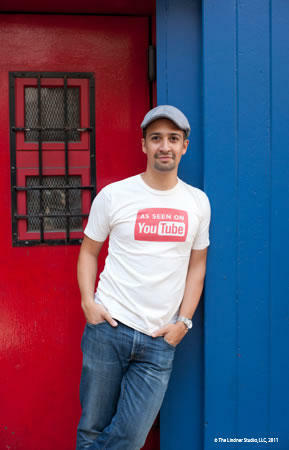 Lin’s latest stage project is entitled The Hamilton Mixtape - a hip-hop musical about the life of US Founding Father and first Secretary of the Treasury, Alexander Hamilton. New York Stage and Film and Vassar College will present two readings of The Hamilton Mixtape this Saturday, July 27th as part of their Powerhouse season. In what is a testament to the popularity of Lin-Manuel Miranda’s work - both readings are sold out and even the wait-list is closed. Still, we were fortunate to grab a few minutes with Lin just before rehearsals began for the readings at Vassar. In the seven years since her last album, Audra McDonald has kept busy…including singing the hook for Neil Patrick Harris' rap at the conclusion of Sunday’s Tony Awards. She spent several years in Hollywood, filming the television series Private Practice. She's gotten divorced and remarried, absorbed the shock of losing her father in a plane crash and watched her daughter, grow up from a kindergartener to a middle-schooler. Last year, McDonald returned to New York, starred in The Gershwins' Porgy and Bess and won a fifth Tony Award. All the ups and downs, triumphs and tragedies are reflected on her new album, Go Back Home. She will be performing at The Colonial in Pittsfield, MA tomorrow night at 8pm. Motown: The Musical is the real story of the one-of-a-kind sound that hit the airwaves in 1959 and changed our culture forever. This exhilarating show charts Motown founder Berry Gordy's incredible journey from featherweight boxer to the heavyweight music mogul who launched the careers of Diana Ross, Michael Jackson, Stevie Wonder, Smokey Robinson, Marvin Gaye and so many more. Featuring all the classics you love, the show tells the story behind the hits as Diana, Smokey, Berry and the whole Motown family fight against the odds to create the soundtrack that changed America. Annie: The Musical is hard-knock life-ing to sun’ll come out tomorrow-ing again on Broadway. The cast recording is available today from Shout! Broadway. The original production of this iconic American musical ran from April 1977 to January 1983. The show is, of course, based on the comic strip created by Harold Gray (which was based on a poem by James Whitcomb Riley). This is the second Broadway revival and it’s directed by James Lapine. Brynn O’Malley plays Grace Farrell, Oliver Warbucks tireless assistant. Brynn's Broadway credits include Wicked, Sunday In the Park with George, Hairspray, and Beauty & the Beast. Regionally, Brynn has starred in Avenue Q and numerous other 1st national and regional productions. She joins us to talk about working with kids and dogs, working with James Lapine, and doing Avenue Q in Las Vegas. Albany, NY – Nikki M. James won the Tony Award for "Best Featured Actress in a Musical" this year for her work as Nabalungi in The Book of Mormon. Sarah LaDuke speaks with her about the show, the Tony, and playing Cleopatra opposite Christopher Plummer's Ceasar at The Stratford Shakespeare Festival. Albany, NY – Sarah LaDuke speaks with Talib Kweli about his music. He's performing at The Colonial Theatre in Pittsfield, MA tonight.